1. Bad posture doesn't inherently cause back pain. 2. Herniated discs and other structural abnormalities don't always cause back pain. 3. Strengthening the "core" doesn't prevent future back pain. 4. "It is an article of faith among many mainstream experts that poor posture, lack of core strength, and/or structural abnormalities such as bulging discs are major causes of pain, especially back pain." 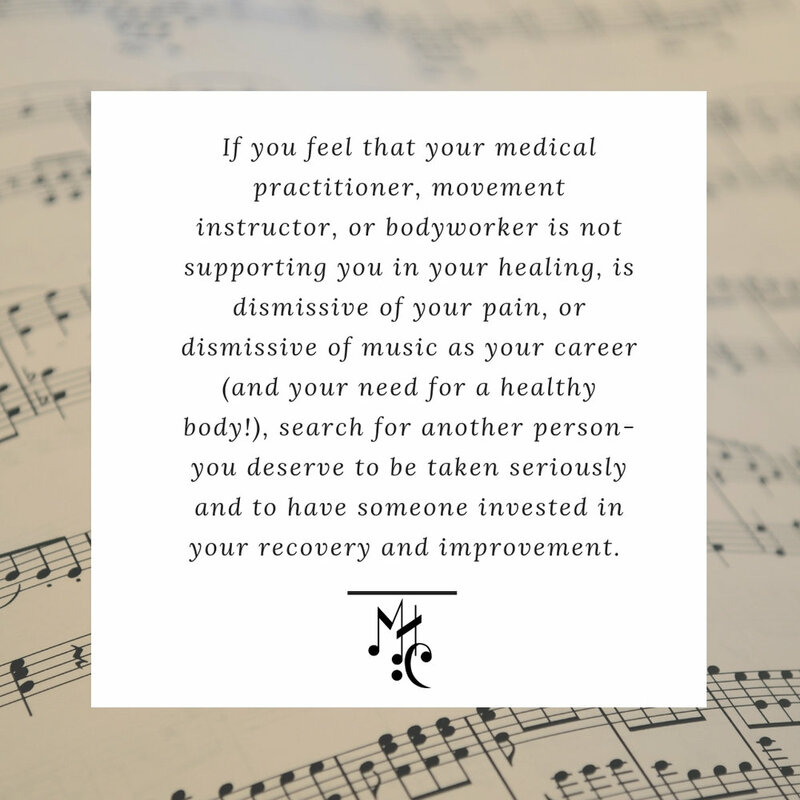 There's a lot going on back here, and there are many layers of myofascial tissue that can be strong, weak, flexible, inflexible, and pain provoking. 1. Poor posture may not cause back pain on its own, but it may cause lots of other issues in your body: Muscle tension patterns, weakened bones, lack of mobility in the spine and neck, etc, all of which can lead to pain and dysfunction. In addition, a "slumped (kyphotic) spine" affects your capacity to breathe because your respiratory diaphgrahm will be compressed and unable to contract and relax fully. (Did you hear that, wind players and singers?) When we move the body out of alignment in standing, walking, etc., we change the wear patterns on our joints, as well as affect the long term bone density. For example, having a head forward position will increase the bone built on the back of the neck and spine, thanks to Wolff's law, while also wearing out the discs in your neck. Wearing shoes with a small toe box with force your big toe to turn towards the little toes and possibly set the framework for a bunion, or bone built at the MTP joint. And if that wasn't enough, whole body misalignment is connected with a host of other issues- pelvic floor, internal organ compression, lack of range in joints...the list goes on. 2. Let's all just try to avoid having herniated discs, shall we? A herniated disc refers to the cartilaginous cushion between your vertebrae, which has ruptured, allowing some of the cushion to spill out. A bulging disc is where that cushiony cartilage has expanded beyond its normal boundaries. Both issues have the risk of being painful, but bulging discs are often less so. Our discs lose their elasticity as we age, but trauma, genetics, mobility, and movement patterns play a role in their health. 3. The core is more than just the abdominal muscles, but in fact refers to all the musculature around your viscera and spine. Strengthening the muscles of your back body as well as your obliques can help one's posture (!) and one's bodily awareness. Also, if you do any sort of movement or exercise practice, your core muscles (rectus, obliques, transverse, spinal stabilizers, back muscles, and more!) need to support you, which can also affect pain. If you want to do a plank in yoga, pilates, or in a gym setting, you have to be aware of your whole body, including your core and spine muscles. As musicians, many of us engage in an asymmetrical activity, which means that one side of the body is taxed much more than the other, which also may mean that one set of abdominals, obliques, transverse, multifidi are stronger than the other from years of asymmetrical habits. While I can't promise that the texting posture will hurt you, I don't think it's great for your body long-term.